Today I decided to test how fat adapted I've become. This morning I had two cups of coffee with 1 tbsp of butter each. Nothing else for breakfast. At just after noon I was starting to get hungry, but I left to go on a mountain bike ride instead of immediately satisfying that initial hunger. A few minutes into the ride the hunger was gone and I had a great ride, fueling with nothing but water for the next two hours. When I got home I was just starting to get hungry. In the past I would have chugged down a post-ride protein recovery drink of some kind, but lately I've been opting to go with real food. It feels so much better to me than trying to rebuild my body with stuff concocted in a lab. 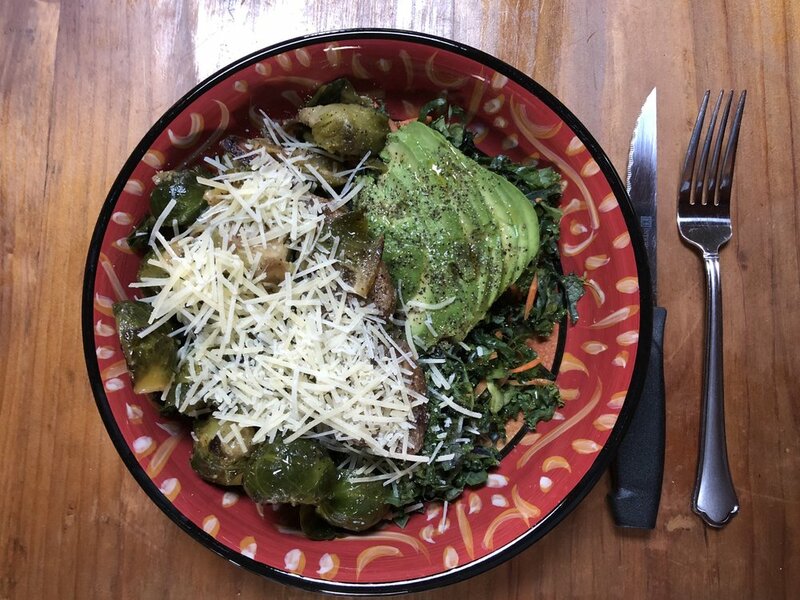 Today's recovery food was kale salad with a lamb rib, Brussels sprouts sauteed in ghee, avocado, parmesan, and a generous drizzling of EVOO. If being fat adapated sounds like something you'd like to achieve then check out my health coaching services and hire me to help you become lighter, faster, and stronger so you can enjoy the great outdoors even more.